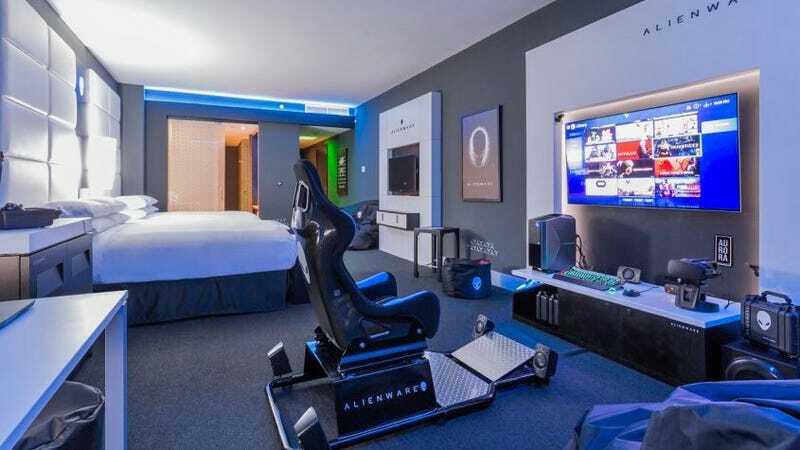 If you’re a gamer who doesn’t want to haul a PC with you on vacation, you could book your next trip to Panama City where the local Hilton has packed a ridiculously customized hotel room full of high-end gaming gear and accessories. The beanbag chairs, VR goggles, and racing seat all make sense to me, but why did the designers bother including a shower and two beds? Situated right on the coast of the South Pacific Ocean, room 2425 at the Hilton Panama features a stunning view of the beaches and water that will presumably wind up hidden behind thick, black-out curtains as guests instead enjoy a 65-inch, 4K OLED TV. That TV is connected to an Alienware PC powered by an Intel Core i7-8700 processor, 32Gb of RAM, and a GeForce GTX 1080 Ti GPU, but guests can also enjoy a 15-inch, Intel Core i7-7700HQ-powered Alienware laptop that has its own 34-inch monitor. Other room amenities include an Xbox One Elite, an Oculus Rift, a 5.1-channel surround sound system, and interactive lighting that’s synced to whatever game you’re playing. And that racing simulator chair? It features NASA-developed upholstery designed to absorb and draw heat away from your body so no matter how intense a game might get, you won’t find yourself drenched in sweat. A single night’s stay in the room will cost you $349, which makes us wonder why the hotel bothered to waste precious real estate on beds and a shower—why not put a couple of arcade machines in there instead? If I was shelling out that much money to hole up in a gaming oasis, I wouldn’t be wasting my time sleeping or worrying about personal hygiene. I’d be playing every game I could until house cleaning came to dig me out from underneath a mountain of Doritos crumbs.